This file photo shows Nokia's flagship store in Helsinki, pictured in 2011. Finnish mobile phone maker on Tuesday announced plans to buy a California firm specializing in rendering the real-world in 3D as it beefed up mapping services for smartphone lifestyles. 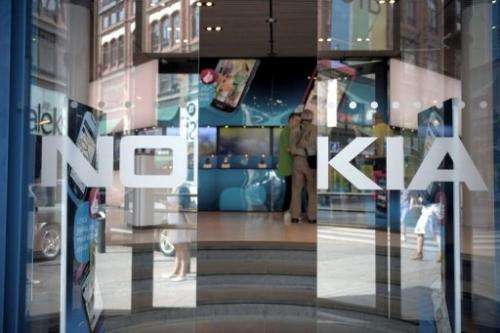 Finnish mobile phone maker Nokia announced plans to buy a California firm specializing in rendering the real-world in 3D as it beefed up mapping services for smartphone lifestyles. Nokia expected to complete its acquisition of Berkeley-based Earthmine by the end of the year. It did not reveal financial terms of the deal. "We are very excited to be joining Nokia - a company with a huge presence and vision in mapping," Earthmine co-chief executive, John Ristevski, said on Tuesday. "We could not hope for a better place to fulfill and accelerate our mission of indexing the world in 3D." News of the takeover came as Nokia unveiled a HERE mapping and location-based services platform that will be powered in the Internet "cloud" to work across an array of devices and operating systems. "People want great maps, and with HERE we can bring together Nokia's location offering to deliver people a better way to explore, discover and share their world," said Nokia chief executive Stephen Elop. "With HERE we can extend our 20 years of location expertise to new devices and operating systems that reach beyond Nokia." Nokia expected to make available in the coming weeks a HERE map application tailored for iPhones, iPads and other Apple gadgets running on iOS software. Apple developed its own mapping program included in its new mobile iOS 6 operating system, and in doing so booted off Google Maps, which had been the default program for Apple devices. But the new Apple program immediately drew scorn for omitting key landmarks and cities, failing to identify correct locations and distorting views from its images. Apple encouraged customers to use alternatives the company works out its bugs. "Maps are hard to get right - but location is revolutionizing how we use technology to engage with the real world," said Michael Halbherr, the Nokia executive vice president in charge of the HERE brand. "That's why we have been investing and will continue to invest in building the world's most powerful location offering." In 2008, Nokia bought Chicago-based digital map maker Navteq in a deal valued at $8.1 billion.